To start with the dilemma, or if you prefer, the instigating incident: I've been working on the method sections for the rewrite of Working with Stories, and I've been snagged on an obstacle. I dodged this obstacle in previous editions of the book but now I'm taking a hard look at comprehensibility and find I can't avoid it any further. It's the section on building narrative sensemaking landscapes, and it's snagged on the Cynefin framework. Trying to find my way out of this confusion, I decided to try and build my own decision support model. Perhaps backing off and thinking about the issues on my own could help me come back and understand another perspective. I asked Sharon (whose background was in hydrology) to help me, and we two scientists sat down and for several hours talked about complexity and systems and societies and decision making. We asked ourselves: if one was to help people make decisions in many situations, what axes of variation would it be reasonable to consider? We came up with two axes that we thought mattered more than anything else: "the degree of imposed order" and "the degree of self-organization." We drew up a two-dimensional space with those axis labels on it and began to place examples into different areas on it (the French revolution, guilds, dictatorships, bees, pulleys, and so on). The messy diagram I show here is one of the few versions I still have (I seem to have discarded most of those notes). After playing with our new nameless model for a while, I felt confident that I could return to Dave's model and try to make sense of it. The next day (or so) I presented our model to Dave. Sharon and I were a bit nervous, since Dave didn't exactly ask us to create our own model. Dave looked at the model I had drawn in silence for half a minute. Then he jumped up out of his chair, rushed across the room, and exclaimed, "It's the same thing!" And it was. Sort of. Mostly. We had it turned around and upside down from his, but essentially we had arrived at the same mapping of concepts. I didn't believe it at first (and have little ability to manipulate objects in 3D in my head, so he had to show me the flipping around part several times) but then I saw it was very close in meaning. In Dave's known/simple domain, the degree of imposed order is high and the degree of self-organization is low. 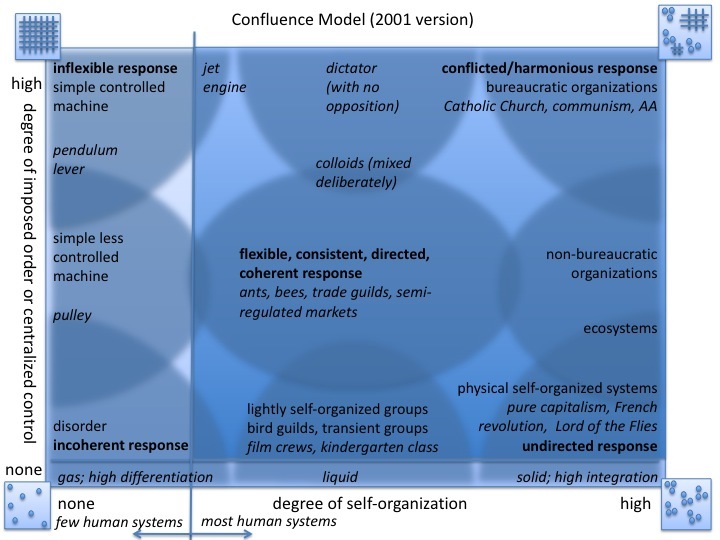 In the knowable/complicated domain, both imposition and self-organization are high. In the complex domain, self-organization is dominant; and in chaos neither are strong. 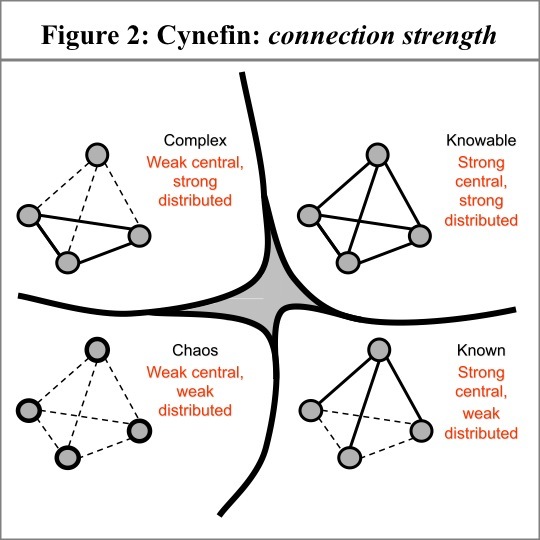 We say "build the framework" because the Cynefin framework is created anew each time it is used, with distinctions meaningful to the current context. To some extent, it does not even exist in the way we describe it here, devoid of context, but is always used to enable sense-making in a particular setting. 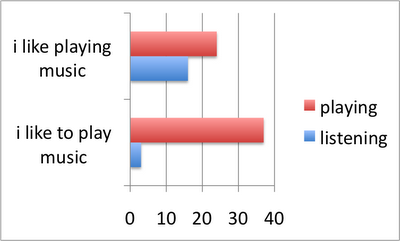 I'm not sure why my version of the model has been talked about so little over the years. It might have a lot to do with me dropping off the seeing-and-being-seen scene following the birth of my son. Or, my version might just be less useful to the greatest number of people. I don't mind if it is less useful; it works for me. I don't need to storm the world with my ideas. Last year I put a (self-published? unpublished?) white paper on my web site essentially trying to explain my form of the model and help people use it, but it was awkward to call it a "form" of the Cynefin framework when so few people think of it that way. And I don't really think of it that way anymore either. And now we come to the issue I've been pondering lately. What should I say in Working with Stories about building a sensemaking framework with stories? 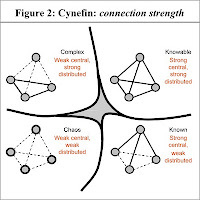 I never could write very well about Dave's Cynefin model, and nobody will think that my model is the Cynefin model. I don't want to confuse people, but I don't want to leave it out again. After a few months of pondering over this, I've finally come to a solution. I think the two models want to amicably part company. They aren't the same model, and they no longer need to be forced to live together, and my life and my task would be easier if they lived their own lives. Now I want to continue the story into another type of confluence, one having to do with thought and originality. I've seen so many people make good use of the distinction between complex and complicated that I began to wonder where the distinction came from. It seems that the earliest mentions of this distinction go back to a 1987 paper by the anthropologists Shirley Strum and Bruno Latour called "Redefining the social link: from baboons to humans." (This is in Social Science Information, volume 26, number 4. You can find it online, for a fee, here.) Strum and Latour introduce the terms in this way. For the rest of our discussion we will consider that baboons live in COMPLEX societies and have complex sociality. When they construct and repair their social order, they do so only with limited resources, their bodies, their social skills and whatever social strategies they can construct. A baboon is, in our view, the ideal COMPETENT MEMBER portrayed by ethnomethodologists, a social actor having difficulty negotiating one factor at a time, constantly subject to the interference of others with similar problems. These limited resources make possible only limited social stability. To summarize our theoretical model, once individuals are aggregated and choose not to avoid each other, there must be a secondary adaptation to a new competitive environment of conspecifics. Two strategies are possible: manipulate the genotypes to obtain different phenotypes (eusocial insects) or manipulate the phenotypes of similar genotypes through increasing social skills. 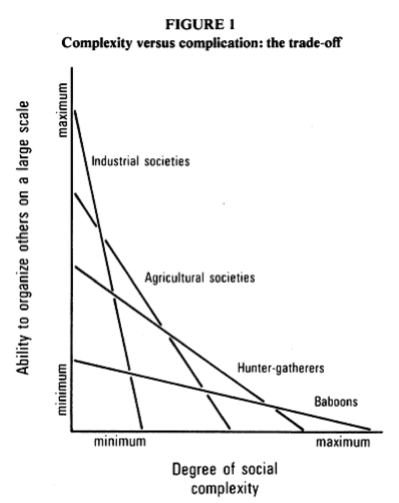 Similar bodies adapting to social life have, themselves, two possibilities: build the society using only social skills (non-human primates) or utilize additional material resources and symbols, as necessary, to define the social bond (human societies). In the human step different types of societies are created depending on the extent of new resources that are used. Now, have you looked closely at Strum and Latour's diagram of their theoretical model? If you haven't, look again. 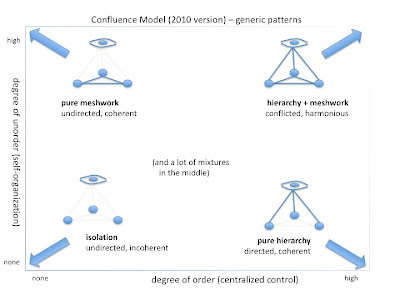 It is identical to my confluence model. Their "ability to organize others on a large scale" is my "degree of imposed order." Their "degree of social complexity" is my "degree of self-organization." Finding this connection to Strum and Latour's model gives me two senses of happiness. First, I'm excited that it came from ethology, my original field, which gives me a sense of circular completion. (It also makes me wonder if I read Strum and Latour's work in graduate school, since it was published the year after I entered a Ph.D. program in the field. Stranger things have happened....) Second, I'm excited that instead of talking about "my" model while standing alone (or with Sharon, or with Sharon and Dave), I can instead talk about tapping into the great confluent stream of understanding that is humanity. Now for the final piece. There is another confluence, a more important one, an ancient one, that I discovered just a few months ago. How I managed to miss it all these years (and everybody else along with me, apparently) is a mystery. Here's how I discovered it. I was having one of my career self-pity-parties and typing my name and the names of everything I've ever created into Google and thinking about how nobody cares about me. (You do it too, admit it! Or some clever spammers wouldn't create fake links that start with "A smart blogger put an intriguing blog post on [your blog name].") So I typed in "Three strands in a braid" which is the name of a paper I published in the online anything-about-the-internet journal First Monday. Surprisingly, I also found links to Three Strands in The Braid, Paula Underwood's book about bringing Native American wisdom to use in contemporary society. I have great respect for Paula Underwood, having been moved by her book The Walking People. I had not meant to tread upon Ms. Underwood's book name, and out of contrition began to look over her braid book. This got me started roaming over web sites on Native American wisdom, which was only a desultory way of avoiding work until I stopped, breathless and amazed, in front of the medicine wheel. The medicine wheel refers to a body of ancient wisdom shared by many tribes throughout North America, as well as a series of sacred structures, some dated to 5000 years ago. Small differences in interpretation and application abound in the medicine wheel structure and meaning, but the essential form is fairly consistent. 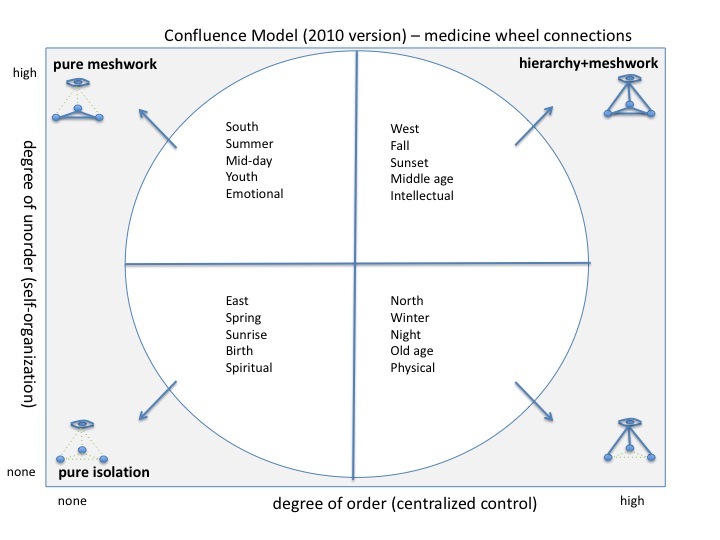 The medicine wheel is also remarkably similar to my confluence model, to Strum and Latour's social-link model, and to the Cynefin framework. 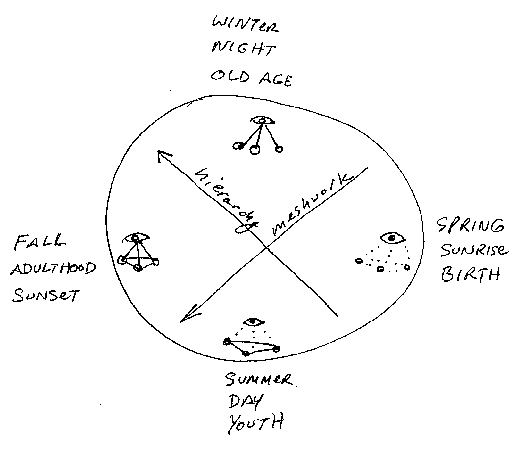 Since this eye-opening discovery I've been reading several books and web sites about the medicine wheel, and it has become clear to me that the confluences on this topic are much, much larger than just a few great minds thinking alike. What I believe we have tapped into, each in our own way, is as large as what it means to be a human being. The power of Waboose [the North] is a paradoxical power. It is new life cloaked in death, rapid growth cloaked in rest. It is the power of the ice-goddess with a warm heart beneath a frozen exterior. It is the power of new life beginning to throb through an apparently rotting seed... It is the power of the trees covered with ice crystals, dancing in the North wind. It is the power of the animals huddling together for warmth, hunting together for food. People naturally form constituent connections all the time, so in a sense, as they say, "hope rises." Dictators attempt to move the situation to the extreme bottom–right corner [simple, known, the dead of winter] where they have absolute control and no other connections exist. Loyalty tests and other mind games are meant to sever nascent connections among the subjugated masses, especially those given subordinate power. However, keeping up such an unnatural situation requires a huge influx of energy, so these situations eventually implode through their own fragility. In other words, extreme order is the paradoxical power of new life cloaked in death, rapid growth cloaked in rest. For humans, youth is the time when everything is fresh and new, when they can see the universe in a raindrop and spend hours looking at the beauty of a blade of grass. Watch an infant stare at a tree and you'll know some of the power of Wabun [the East]. Youth is ... the time of experiencing everything as a first. It is the time of swimming in the stream of pure energy unhampered by the limitations of age, or of fears. It is the time when vision is expanded, like that of the eagle, when people seee as if from a high place.... [People who are comfortable in this place] have the ability to reach to the realms beyond the earth, in a natural and intuitive way. The people associated with Wabun have wisdom, and the possibility of bringing illumination and enlightenment to themselves and those they touch. The chaotic domain is in a very real sense uncanny, in that there is a potential for order but few can see it — or if they can, they rarely do unless they have the courage to act. In known space it pays to be canny, that is, to know how to work the system in all its intricacies (canny meaning not only shrewd but safe). But in chaotic space, a canny ability gets you nowhere (there is no system to be worked). You need a different type of ability, one that is uncannily mysterious, sometimes even to its owner. Canny people tend to succeed in their own lifetimes; uncanny people tend to be recognized and appreciated only centuries later, because during their time their actions appeared to be either insane or pointless.... [Chaos] brings new perspectives, which cause radical disruptions in stable patterns of thought and lead to new complex patterns. At midday the lessons of the spirit received during sleep are put into action as people make plans and their direction for the day grows and takes shape. This is the time of reaching outward and growing in the things of the world. It is the time of testing wisdom by bringing it into physical being and helping it to grow. Sometimes the original direction is correct, and sometimes it must change; to know, the idea must first become an external reality. The decision model in this [complex] space is to create probes to make the patterns or potential patterns more visible before we take any action. We can then sense those patterns and respond by stabilizing those patterns that we find desirable, by destabilizing those we do not want, and by seeding the space so that patterns we want are more likely to emerge. In human life the middle years are those of power. You have experienced some of life. You have learned some of its lessons and made your initial mistakes. You have tried working on the many projects that seemed appealing in your youth and often have found the direction that you were meant to take. Once you find your direction, you receive the power that comes with knowing where you are going.... The middle years are the ones of responsibility. There are growing children to raise, there are aging parents to care for, there are younger brothers and sisters to teach and help to find their own paths. While stable cause and effect relationships exist in this [knowable] domain, they may not be fully known, or they may be known only by a limited group of people. In general, relationships are separated over time and space in chains that are difficult to fully understand. Everything in this domain is capable of movement to the known domain. The only issue is whether we can afford the time and resources to move from the knowable to the known; in general, we cannot and instead rely on expert opinion, which in turn creates a key dependency on trust between expert advisor and decision maker.... 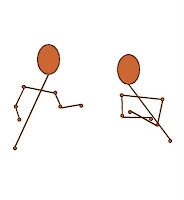 Just-in-time (JIT) transfer is movement from the complex to the knowable, selectively. 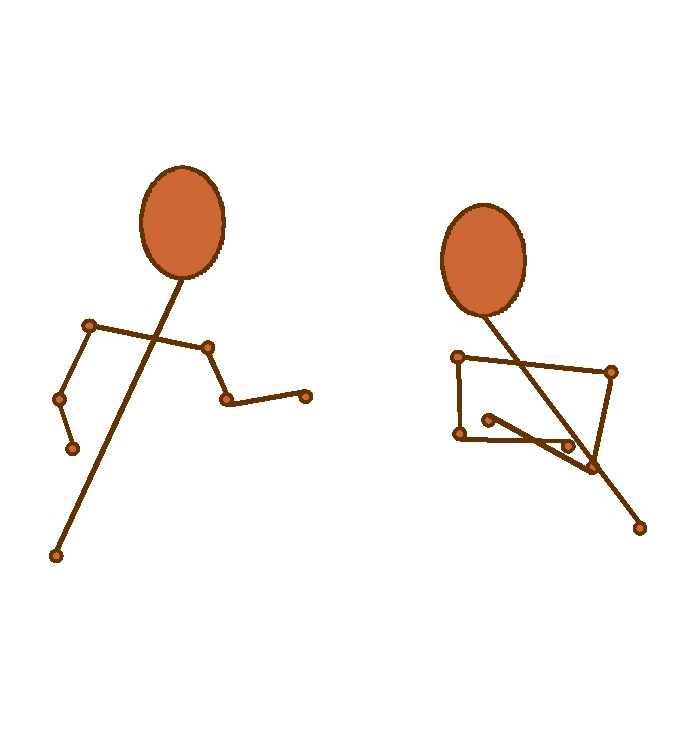 This movement is often called exploitation in the complexity literature, and it involves the selective choice of stable patterns in complex space for ordered representation. 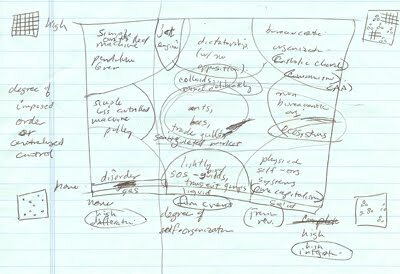 If you are at all familiar with the domains of the Cynefin framework, you can quickly see the mappings here. You can also see that the dimension of central order shared by my confluence model and Strum and Latour's social-link model increases from the Southeast to the Northwest, and the dimension of self-organization increases from the Northeast to the Southwest. 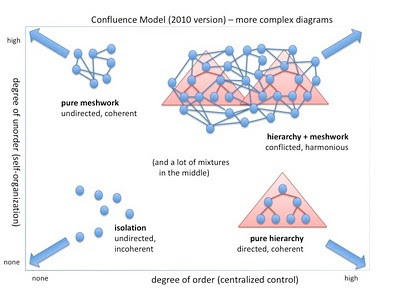 We do not pretend that all the basic ideas inherent in the Cynefin framework are new or unique. They can in fact be found floating around history for thousands of years. I just hadn't known they were floating around in this amount of detail at the time. When I wrote that I was thinking mainly of the many folk tales and mythologies that distinguished between imposed and self-organized structure (I mentioned the Babylonian creation myth which is just one of many such references). This association opens up whole new areas of thought for me. For example, most versions of the medicine wheel include a middle region analogous to the disorder region in Cynefin terms. There are two more directions -- up to the sky and down into the earth -- which are not found in either the Cynefin model or my confluence model, so I'll be exploring how those might usefully fit in. I'm intrigued as well by the circle around the outside of the wheel, which is meant to demonstrate the unity of all conditions in one intermingled world. In addition several books have been published that explain how the concepts of the medicine wheel can be used in sensemaking exercises not unlike those I've used myself. For example, one activity involves "walking the wheel" to think about how a situation might be seen from each of the four directions and how one might thereby gain a deeper perspective on it. It's hard to describe my feelings of humility, privilege and wonder on realizing that I and others have stumbled onto a truth that is at least several thousand years old. I am only beginning to explore what has been written about the medicine wheel and will continue to do so. Of course, what I can discover as a person of Eastern European ancestry and conventional scientific training will be something quite different than what a Native American can learn from the elders in their tribe. From what I've heard there is much more not available in books. Still, I eventually hope to arrive at a place where I feel that my understanding has benefited from all possible exposure to the great confluent stream of thought and wisdom I have encountered, and where I can in turn give something back, if only respectful attention, to the stream itself. Now please note that I do not wish to claim that the medicine wheel is the same as the Cynefin framework, or Strum and Latour's model, or that it is better or more correct than these, or any other such nonsense. The reason I am excited about this discovery is because it enlarges, not reduces, my ability to help people make sense of the world. This is an amazing degree of parallelism between systems that seem on the surface to have nothing in common. I'm beginning to think the whole construct is something that may have come up many times in human history, like the Golden Rule or the ziggurat or the oft-repeated concept of "it's bigger on the inside than the outside" (that's one of my fantasy-Ph.D. dissertations right there). What I'm most concerned about is not who can claim credit for anything but what we, all of us, can do with it. 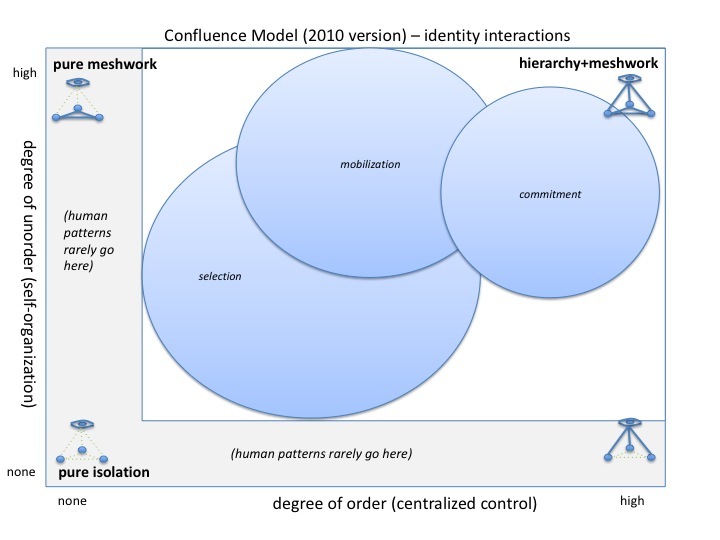 What makes a model fit for sensemaking? In practical terms, this solves my problem with writing a method description for sensemaking landscapes in Working with Stories. I will simply describe multiple ways of framing a landscape for group sensemaking, among which people might have different reasons (background? personality? goal?) to choose. 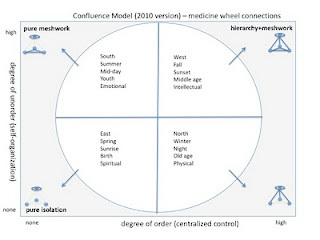 You might want to choose the labels of the Cynefin framework, of my confluence model, of Strum and Latour's social link model, of the medicine wheel, or of other models I know nothing about. This also allows me to write about each of the frameworks I do know about without either subscribing fully to it or assuming that everyone else thinks in the same way I do. The obvious next question is: where do we stop? What sorts of models are not useful for narrative sensemaking? 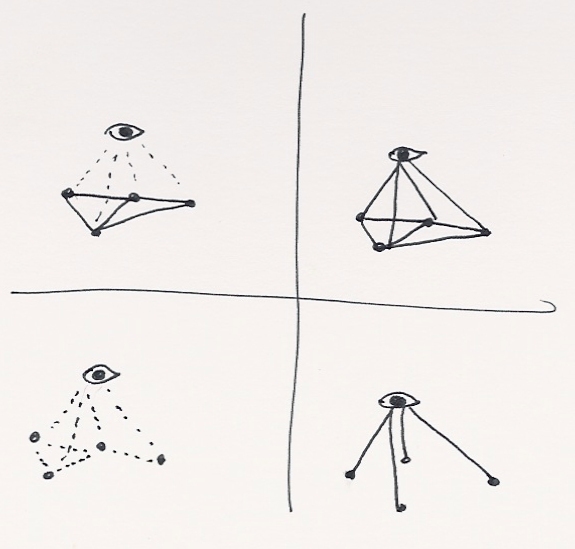 The utility of building a sensemaking framework lies in its ability to enable the emergence of new understandings from the overlaying of many seemingly disparate experiences and perspectives. It is a convergent technique, a way of moving from specific to general: but not by categorizing, which is done beforehand and is not an activity of discovery at all. Rather, it shares something with the idea of grounded theory, in which data create rather than prove or disprove theory. 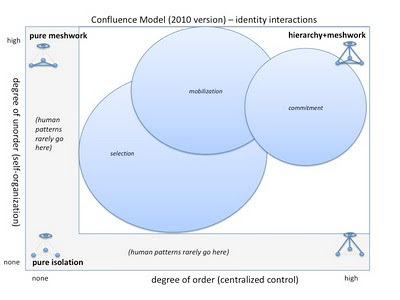 Because of the way sensemaking works, many models work as well as others, in the proper context; but for the same reason there are some characteristics a model has to have before it can be useful. I've come up with three so far. 1. Value-free dimensions. Sensemaking depends on the self-organized emergence, not the straightforward creation, of meaningful patterns in the things considered. If the placement of items into patterns is predetermined, no sensemaking can take place. To illustrate this, consider two group activities you might conduct in a gymnasium full of people. Let's say you first ask everyone to stand in front of a large marked scale of heights. 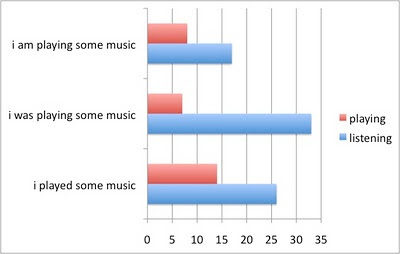 This is a predetermined placement, so doing the exercise brings no additional insight that could not be gathered from, say, measuring each person independently and collating the responses on a computer. Now consider what would happen if you asked each person to stand in a location that best fits their agreement with a series of statements posted around the room. The patterns that result from this exercise probably cannot be predicted even if you know the people in the room very well. If you ask each person to answer a set of survey questions, you will not get the same result. To begin with, an act of physical positioning (whether of yourself or of an object) invokes a different set of cognitive processes than preparing a linguistic response. But more importantly, the people in the room wouldn't be human if they didn't negotiate meaning by continually monitoring where they and the others are in the room (constantly subject to the interference of others with similar problems). Such an activity would not represent an objective or experimentally repeatable method of measurement. But measurement is not the goal; sensemaking is. 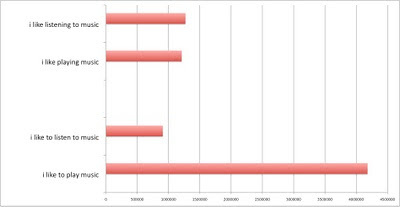 Many models built for understanding and communication have implied or explicit value axes. 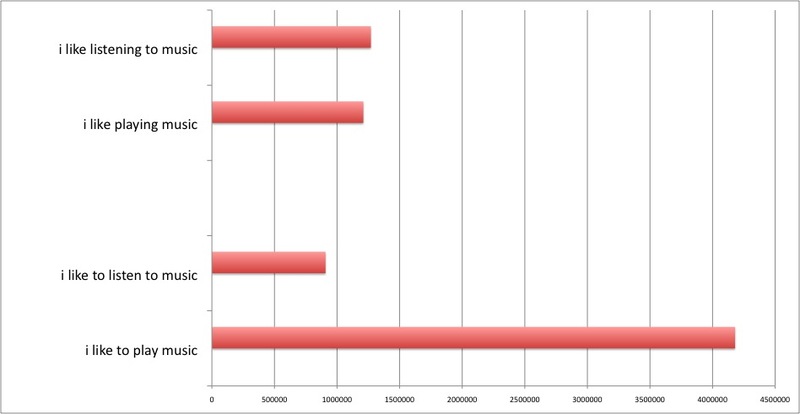 The classic case is of the graph where the approach you wish to evangelize is in the upper-right-hand corner (nearest to God). 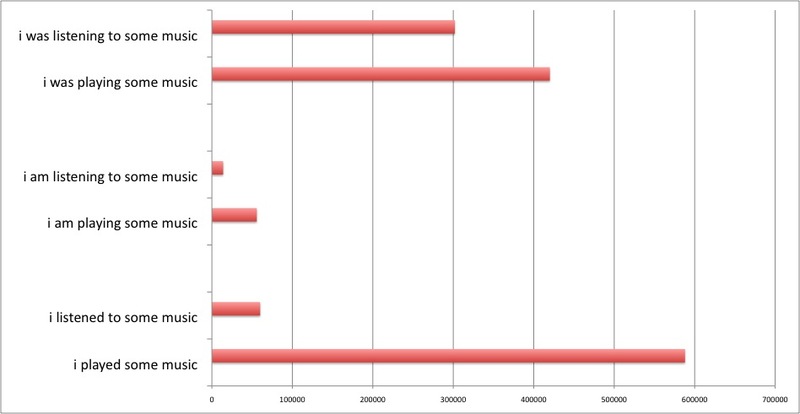 You can use value-based models for sensemaking, if you can obfuscate the value axes. You can switch the directionality so that our common up-is-good bias is subverted (the right-is-best bias may be culturally variant and probably has a lot to do with writing direction -- hey, wouldn't that be an interesting dissertation topic). Another method of subversion is to change the terms used so that they confuse direct communication of value. If you want to use a model with an axis called "efficiency," think of either a value-free way to talk about it (perhaps "precision" or "agency") or think of some way to highlight both the positive and negative aspects of it at once (something like "getting things done efficiently, even if they are nasty things"). But if you have to work really hard to push a model into value-free use, don't deceive yourself; better to use another model than to destroy what could be valuable insights. 2. At least two dimensions. The essential activity in building a sensemaking framework is the mapping of elements, in this case narratives or elements of narrative, onto a space of resonant meaning. 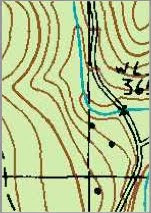 Building a topographical map entails gathering information about point descriptions: longitude, latitude, height and meaning. The addition of meaning is not always noticed, but if you look at a real topographical map, labels such as the names of mountain peaks and lakes and the locations of human-made structures are as important as contour lines. In the example I show here, roads, streams, buildings and administrative boundaries are marked. (The little dot near the bottom is my house, which has a lot of meaning around here.) Building a sensemaking landscape requires a similar process. So it follows that in order to build such a map you must define what your longitude and latitude mean; what height pertains to (if anything); and what features will be marked. All of the models I've described here define two dimensions of variation, either explicitly or implicitly (by marking out the rarified extremes of the space). 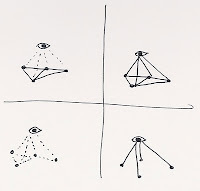 From what I've seen, you need at least two dimensions in order for sensemaking to work well. Models that feature triangles or pyramids (lots of this, some of this, little of this) are really only unidimensional, so they don't work. Why doesn't one dimension work? Well, first, if you are trying to squeeze the values out of an axis (and people are very good at squeezing values into axes), the effort is more obvious if there is only one axis. People have a harder time finding out the correct answer if there are two overlaid dimensions, especially if at least one of them is flipped from their expectation. I've seen people use one dimension of variation for sensemaking, but the insights gained seem to be thinner and weaker; there is less sense made. What about three dimensions? Well, there are two problems with sensemaking in three dimensions. First, it requires more physical preparation. Preparing to place flat objects on a wall is much easier than preparing to place three-dimensional objects in 3D space. You could have people sculpt a clay surface together, and that might yield some fascinating insights, but it could also just get messy. Also, I must enter here a plea from the non-3D-thinkers population: beware of thinking 2D representations of 3D objects are 3D objects. 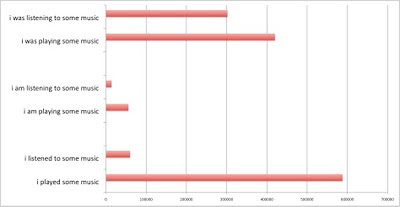 Some people have the ability to look at such representations (usually on computer screens) and think about them. Many of us don't. I remember in graduate school when the wave of 3D Tetris hit. I had been marginally adequate at regular Tetris (though I'm not a fast thinker in any number of dimensions). But when I was faced with a 3D Tetris challenge, I simply froze, turning the virtual object over and over but unable to come up with any plan for putting it anywhere. I watched in amazement as other people manipulated and dropped the Tetris things (what do they call them?) in microseconds. Clearly this is a genetic determination, and clearly some of us were not standing in the 2D-as-3D line when they gave this ability out. (I think I was over by the left-handed synesthesia booth.) It's much easier with physical manipulation, but people who have the 2D-as-3D ability sometimes forget that the rest of us can't follow them into that world. So to be safe and include every voice, I'd stick to two dimensions. 3. Meaningful space. The last requirement of any model that supports sensemaking is that it resonate meaningfully with the people who use it. This is the main reason that I think replacing the terms on the bubbles or axes or quadrants or circles of whatever model you want to use is perfectly permissible, as long as the translation is true. Because if the space doesn't mean anything to the sensemakers, the patterns won't mean anything either. Find a space that works in practice, not just in theory. You can only find this out by trying it in practice with any particular group. What I like to do is have a few manifestations of any sensemaking model on hand so that if one isn't resonating I can pull out another, relabel, and try again. Or you can use the salad-bar method and present two or more sets of labels at once and ask people to choose what works best for their group. 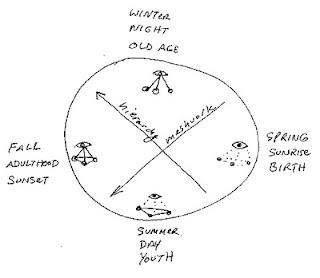 (The spring, sunrise, birth, air, spirit labels do this in the medicine wheel.) Another method is to explain what you mean in general and ask the people themselves to come up with their own labels (while you check the translation for accuracy). This approach tends to require a more motivated group; some will respond to such a request with bland refusal. Be ready to do what works and adapt to the conditions you find. There are other requirements for sensemaking regarding the items used (their focus and breadth), the physical setting, the people involved, and so on, but that is another topic for another time. With regard to the conceptual frameworks and models you can use for beneficial narrative sensemaking, I'm happy to say that I've found much to explore. Hopefully this will be of as much use to you as it has been to me.